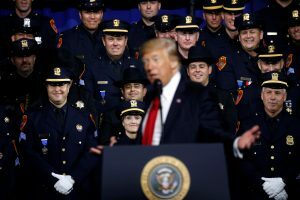 On a visit to Long Island, New York, last week, Trump implored police officers, “Please don’t be too nice.” He said some officers are too courteous to suspected criminals when arresting them. His remarks prompted critics to accuse the president of encouraging police brutality. Trump touts himself as a president who is “strong on law enforcement” and tough on crime. His ongoing efforts to tackle illegal immigration and crack down on gangs operating within the U.S. were key campaign platforms that his administration is now pushing to implement. But his efforts have been overshadowed recently by his falling out with Attorney General Jeff Sessions. Trump has repeatedly expressed disappointment since Sessions recused himself from the ongoing investigation into Russian meddling in the 2016 election and into contacts Russian officials may have had with Trump campaign associates. Sessions, who attended a Cabinet meeting at the White House Monday, is slated to speak Tuesday to a group of black law enforcement leaders in Atlanta about his efforts to support police as part of his tough-on-crime agenda. He has so far been silent on the president’s remarks, and the Justice Department did not immediately say whether he would mention them during the speech. Sessions has said far-reaching federal civil rights investigations of police departments can malign entire agencies and make officers less effective on the streets, but he has promised to prosecute individual officers who break the law. Still, he believes low officer morale can contribute to spikes in violence.